There are numerous reasons to choose cosmetic dentistry treatment; some might be considered more valid than others although the associated costs make it an option that is seldom taken lightly. Whilst many would say that appearances do not matter, and perhaps there are many strong arguments for why this would be a good thing, the fact remains that you will get judged based upon your looks in many areas of life. The loss of teeth as a result of trauma is one common factor that leads to people choosing dental implants. In fact, you may argue that this is not really cosmetic at all. Loosing your teeth can have a profound effect on your cosmetic appearance but it will also significantly reduce your ability to enjoy normal foods and live a normal life. Those with missing teeth may also experience negative opinions from people that they encounter in their daily business and assumptions that they are perhaps a trouble maker or violent person. Looking good is not always based upon the opinions of those who look at you. It comes from the confidence that you have taken all of the necessary measures to look after yourself. Having an attractive smile might play a big part in this. When you look in the mirror in the morning, it is important that you like what you see and from this we can gain a lot of confidence that can be taken forward into the day's tasks. Cosmetic dentistry has underwent a massive transformation in recent years, with many exciting new technologies hitting the marketplace, such as the Inman Aligner invisible brace system and ever more advanced Teeth Whitening treatments that can make your teeth much whiter in an incredibly fast time-scale. However, the history of cosmetic dentistry goes much further back than that. For many thousands of years, people have been visiting the local dentist in an attempt to get a more attractive smile. 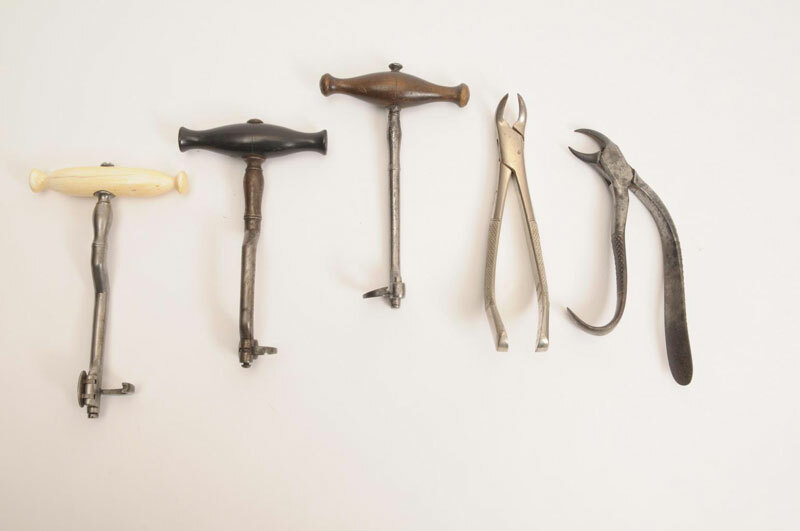 The scary looking bunch of instruments above would have been the standard kit of a 19th century dentist. That, coupled with the fact that anesthetic provisions were rudimentary at best, means that a visit to the dentist would have been a very terrifying experience indeed. Cosmetic dentistry goes back even further than this though. Did you know that the ancient Romans believed that gargling with urine would help with teeth whitening? There may actually be some truth in this, as the ammonia content would have removed some staining (Source: http://www.tweedsmuirdentalcare.com/scared-of-the-dentist-try-living-over-100-years-ago.php). Even with these possible benefits, it is very reassuring to know that dental technology has advanced a great deal since the days of Julius Cesar!